Three men cross the wastelands to a strip town along the Road. They've come to kill a woman. The only person seemingly in their way is unofficial mayor Karsman. Officially Not in Charge, but Karsman's brain houses multiple personalities that could mean the difference between life and death for the hunted. 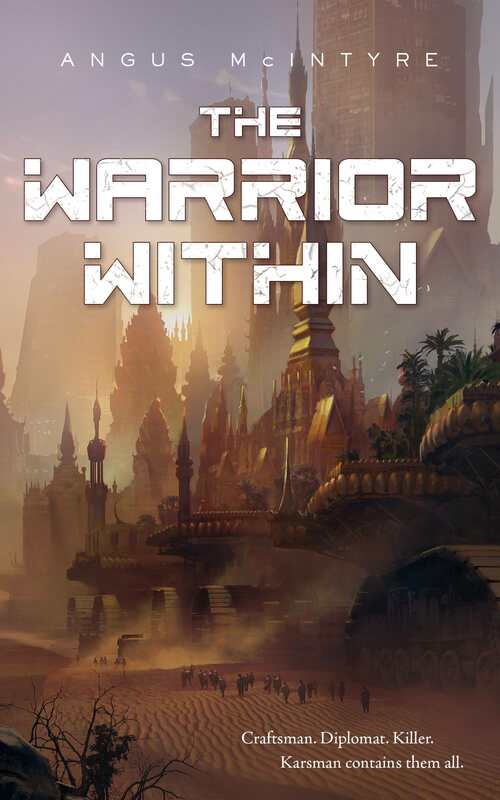 While not going to thrill many, The Warrior Within is a competent novel. It's short, but rarely strays from its compact plot, while still developing a world and characters in it. Karsman gets the most focus and is distinctly a reluctant hero. While shaping Karsman's voice, his other personalities, named by function like Warrior, Diplomat, and Strategist, likewise have their own aims and tone. Karsman and his personalities easily double the cast of characters, with the rest functional but a little flat. In particular, the villains of the story don't really have much going on beyond menacing. There's no indication that this novel is setting up a series, but it could. It takes place on a backwaters world in a larger universe, and hints at what could be beyond this small town, its benevolent autocracy, and the people scraping by. If anything, The Warrior Within did a better job of setting up future works than telling this story, but it's by no means bad.